It's that time once again. 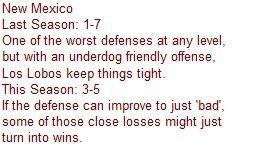 The college football season is upon us, and I, your humble narrator will walk you through ten games each week where I think we can beat the Las Vegas line. Sit back and enjoy the best three months on the calendar. Home teams in Bold. As I mentioned in some off-season posts back when it seemed like the college football season would never arrive, SMU has developed a very strong homefield advantage under June Jones. This season, the Mustangs will be taking a small step-up in competition when they join the American Athletic Conference. But, first things first, the Mustangs will host a Texas Tech team breaking in a new coach, who just happens to be a former outstanding player at the school. The last time these two teams faced off was in 2010 in Lubbock when the Tommy Tuberville era began at Texas Tech. The Red Raiders won that game 35-27, but failed to cover as a nearly two-touchdown favorite. SMU has been a beast as a home underdog under Jones, compiling a 6-1 record Against the Spread (ATS) since 2009. Look for that trend to continue with the Mustangs having a decent shot at pulling the outright upset here. Since taking over as head coach of the Broncos prior to the 2006 season, Chris Petersen has posted a sterling 84-8 record. That is an absurd, Playstation-like winning percentage. Under his guidance, the Broncos have acquitted themselves quite well against teams from BCS conferences, going 8-2 both straight up and ATS. However, the Broncos two failings ATS have come against the Huskies. In 2007, Boise State ventured into Seattle as a field goal favorite, but lost 24-10, and in last year's Las Vegas Bowl, the Broncos were five point favorites over the Huskies, but won by just two. Still, despite that knowledge, Boise State seems to have value catching more than a field goal here. The Broncos were ridiculously inexperienced when they traveled to Michigan State to open the 2012 season and still managed to hang with the Spartans for the entire game. I think the Broncos will do more than just hang with the Huskies here. They have a great chance at upsetting the Huskies and getting themselves in the (way too) early conversation for a BCS bowl bid. Just two years removed from a national championship, the Auburn Tigers fell on hard times last season, as they went winless in the SEC and won just three games overall. Seeking a return to their former glory, the Tigers hired Arkansas State head coach, and former Auburn offensive coordinator, Gus Malzahn to guide them back to respectability. If Malzahn can have a debut similar to the last Arkansas State coach to land in the SEC, the Auburn faithful would probably take that. However, while there is optimism at Auburn, fans merely need to look on the visiting sideline to realize that rebuilding projects don't always happen over night. Mike Leach spent ten seasons at Texas Tech, averaging over eight wins per season, and never finishing worse than 7-6. In his first season seeking to revive a woebegone program in Pullman, Leach finished just 3-9 and won only a single conference game. Suffice it so say, Auburn fans should probably take a cue from Larry David and curb their enthusiasm this season. With the way they played last season, its hard to back Auburn giving more than two touchdowns, even if they are playing at home. Bank on the Cougars keeping this one relatively close. As mentioned on numerous internet sites in recent years, Les Miles does not do a great job of covering the spread, particularly as a betting favorite. Against non-conference foes since 2008, LSU is just 6-12 ATS as a betting favorite. Now, the Tigers usually win those games, going 16-2 overall in such contests (with both losses coming in the postseason to Penn State in 2009 and Clemson in 2012), but covering the number is not their forte. 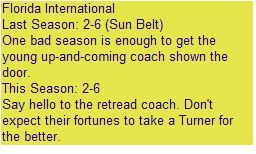 TCU will present a formidable test for LSU despite the fact that they went just 7-6 last season in their return to a major conference. The Horned Frog defense should keep this one close and don't you just get the feeling that LSU wins this one by about a field goal? Welcome to the ACC Panthers. In their first conference game, the Pitt Panthers will host a Florida State team that appears to on the verge of returning to glory under Jimbo Fisher. In three seasons at the helm, Fisher has guided the Seminoles to 31 wins, a conference title (their first since 2005), and their first finish in the AP top-10 since 2000! However, as double-digit road favorites, the Seminoles have been less than imposing. Seven times last season, Florida State was a double-digit favorite away from Tallahassee. The Seminoles only covered once, in the bowl game against an over-matched Northern Illinois team. The Seminoles lost at NC State and escaped at Virginia Tech and versus Georgia Tech in the ACC Championship Game. Unlike Florida State, Pitt is hardly saddled with any preseason expectations. However, based on at least one objective rating system, Pitt has actually been quite solid despite their middling won/loss record over the past few seasons. Playing at home and getting double-digits against a team with a suspect history of covering as a big road favorite make the Panthers the pick here. This game has all the makings of a Florida State escape. In 2012, Oklahoma State was one of the best five-loss teams in recent memory, losing three games by a touchdown or less while winning seven games by at least three touchdowns. Meanwhile, Mississippi State was one of the softest 7-0 teams in mid-October, compiling wins against a trio of Sun Belt teams, a IAA lackey, and three SEC teams that would not taste the postseason (and also fire their respective coaches). 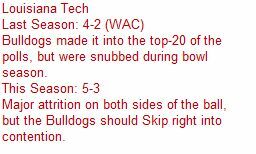 The Bulldogs came back to earth, winning just once in their final six games, with each of their five losses coming by at least two touchdowns. The Cowboys have a chance to win their second Big 12 title in three seasons and are a healthy 16-10 ATS as a double-digit favorite the past five seasons, so laying this large number should not scare potential backers away. By the same token, the Mississippi State Bulldogs are just 3-7 under Dan Mullen as double-digit underdogs. This should be a high-scoring affair that may be close for awhile, but Oklahoma State has too much firepower to win this game by fewer than two touchdowns. When the music stopped (for now), the best team (outside of Boise State) without a seat at the BCS conference table has to be Cincinnati. The Bearcats have been consistently good, and occasionally great since Mark Dantonio took over in 2004. The Bearcats have won at least ten games five times in the past six seasons and have won outright or shared four of the last five Big East crowns. But alas, like Rodney Dangerfield, they cannot seem to acquire any respect, or something to that effect. The Bearcats begin the Tommy Tuberville era as double-digit favorites against a Purdue team that fired its coach despite back-to-back bowl appearances. However, truth be told, Purdue was never really what one might call a good team in either of those seasons. Now the Boilermakers are breaking in a new coach as well as a new backfield. Look for the Bearcats to win this one handily, not that many folks will notice. Doesn't this game just feel right? Other than the fact that it is happening on Labor Day Weekend. This game feels like it should be played in more wintry weather. The two northeast schools with the most tradition battling for supremacy on a neutral site can give one a sense of nostalgia. While these two played a home-and-home series in 2008 and 2009 (both games won by Penn State), they actually played each season from 1944 to 1990. Both team's were surprisingly good last season, with Penn State shaking off the effects of a scandal, a new coach, and an 0-2 start to win eight of their final ten games with the only losses coming to Ohio State and Nebraska. Meanwhile, Syracuse regrouped from an 0-2, 1-3, and 2-4 start to win six of their last seven, including over Missouri of the SEC, and former conference-mate West Virginia in the Pinstripe Bowl. Syracuse lost their head coach and quarterback to the NFL and appear to be in a rebuilding mode. Penn State is a solid 11-3 ATS as a favorite away from home since 2008 and should be able to handle their business here. Perhaps the biggest game of the first weekend pits a pair of teams harboring legitimate darkhorse national title hopes. This game is huge for Clemson. Lose here, and they're just another ACC team that can't compete with the heavy weights of college football. Outside of this game, they only have two more opportunities at big-time scalps (Florida State and South Carolina). Win, and outside of a tricky road trip to NC State in three weeks, they can gear up for their mid-October battle with Florida State that should decide the Atlantic Division. For Georgia, there is no rest for the Bulldogs. After dealing with Clemson, the dogs will travel back home to Athens to take on South Carolina next week and LSU two weeks after that. 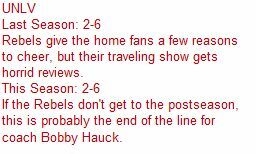 Both those games are at home, but they are also infinitely losable. I'm sure Mark Richt has no desire of a repeat of 2011 when his Bulldogs began the season 0-2 before rebounding to win the SEC East. Georgia is a solid 7-3 ATS as a road favorite since 2009 and 5-1 ATS over that same span in the regular season as a single-digit favorite. Clemson is rarely a home underdog in Death Valley, but they are 0-3 ATS in such situations under Dabo Swinney. 2013 marks the first time the Rams have been favored in this series since 2006. However, despite being underdogs the previous six seasons, the Rams have actually beaten the Buffaloes twice. 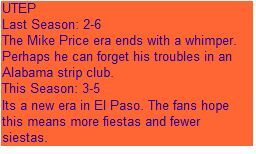 The Buffaloes have fallen on hard times lately, winning just four games over the past two seasons, and not posting a winning record since 2005. The Buffaloes probably upgraded at the head coaching position by tabbing Mike MacIntyre, the miracle worker from San Jose State, to lead their squad. However, while MacIntyre did great things as San Jose State, his first season featured only one win in thirteen games and a 5-6 record ATS. Colorado State returns 17 starters and appears to be on the upswing. They should be able to beat their in-state rivals by about a touchdown. The season is practically here. This is the last Saturday of 2013 that we will be without football! Rejoice, and enjoy the final season preview. Did you know that six of the eight current Sun Belt head coaches have previous college head coaching experience at a level other than IA (or FBS)? Perhaps that is not terribly surprising as more half of the current league membership (Georgia State, South Alabama, Texas State, Troy, and Western Kentucky) have transitioned from IAA (or FCS) within the last decade or so (and three within the last two seasons). Still, outside of the four current Sun Belt head coaches who have been with their teams through the transition periods, Louisiana-Lafayette and Louisiana-Monroe are also coached by men with prior collegiate head coaching experience outside of the IA level. 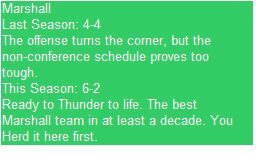 How do the other nine conference stack up in this regard? Do other leagues have a large number of coaches with prior experience at lower college levels? 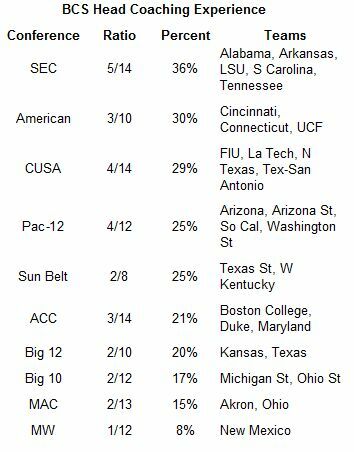 The table below ranks the ten IA conference by the percentage of teams coached by gentlemen with such prior experience. 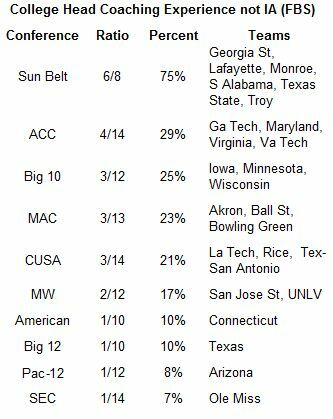 As you can see, with their recently transitioned teams, the Sun Belt has far and away the largest percentage of such coaches. Ranking second, perhaps surprisingly, is the ACC with four of 14 such coaches. At the other end of the spectrum, the SEC has only one such coach out of 14. Since the SEC is likely the toughest conference in which to acquire a head coaching job, it should come as no surprise that five of the current 14 head coaches have previous experience coaching teams from BCS conferences. Here is how all ten conference stack up in regards to coaches with previous experience at the BCS level (and Notre Dame). We are on the home stretch. The countdown has reached single digits and we are on our penultimate preview. 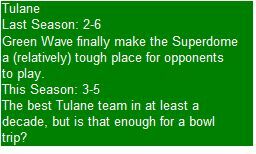 In this post, we'll examine the MAC and see if they can send a team to a BCS bowl game for the second consecutive season. 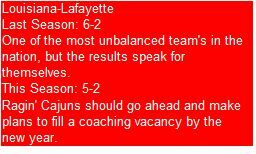 The MAC has been a very topsy-turvy conference over the past few seasons. One year a team is busy winning just a single game. The next year they win the whole conference. Similarly, a team can be riding a 40-year bowl drought, and then come within an overtime period of qualifying for a BCS bowl. Or I should say, one half of the conference has been topsy-turvy. In the MAC East, no team has repeated as division champions since Miami of Ohio in 2003 and 2004. However, out West, Central Michigan won three MAC West (and MAC Championship Games) in four seasons from 2006-2009. 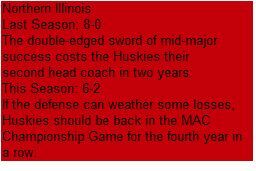 Furthermore, Northern Illinois has won the past three MAC West titles and is a heavy favorite to make it four in a row in 2013. The MAC East has truly been the land of opportunity, but the MAC West has been a territory of hegemony. The table below lists the MAC division champions since 2006, as well as their respective division finish the previous season. Amazingly, MAC East champions have finished an average of fourth the prior season, with each champion save one ranking third or lower. On the other hand, no team in the West has risen from further than third to snare the division title. Expect more of the same in 2013. As mentioned earlier, Northern Illinois is a heavy favorite to repeat in the West, and if they do not, I feel comfortable that either of the second place finishers from 2012 (Ball State or Toledo) will represent the West in the MAC Championship Game. In the East, Kent State enjoyed a once in a generation season in 2012 and is unlikely to repeat their resplendent campaign. Bowling Green finished a strong second in 2012, but outside of an Akron or Massachusetts title, either of the the trio of Buffalo, Miami, or Ohio could rise from obscurity to a division championship. We have entered the home stretch. Less than two weeks to go until kickoff 2013. In this post, we'll turn our attention to Conference USA. While the league lost four teams to defection to the former Big East (Houston, Memphis, SMU, and UCF), they now welcome six new members. Four join from the Sun Belt (FAU. FIU, MTSU, and North Texas) and two from the WAC (Louisiana Tech and Texas San-Antonio). From North Carolina to Texas, Conference USA is truly a national conference. While brainstorming ideas for the what to write about in my Conference USA post, I was looking over the career of North Texas coach Dan McCarney. McCarney has been a head coach at the IA level for 14 seasons, 12 at Iowa State and two thus far at North Texas. During that time, he has won less than 40% of his games, yet still manages to be gainfully employed. Granted, Iowa State is far from a football power and McCarney did take them to five bowl games during his tenure. Plus he has also won more games in two seasons at North Texas (9) than his predecessor did in four seasons (8). Still, managing to coach for a decade and a half despite winning under 40% of your games is a little unusual. How unusual is it? Has any active coach out McCarneyed McCarney? To find out, I decided to develop a simple metric to rate coaches based on their winning percentage and total seasons coached. The formula seeks to find the active coach who has struck the best balance between longevity and mediocrity. And best of all, it is very simple. Take the number of seasons a coach has stalked the sidelines as a head coach (on the IA level) and divide by his winning percentage (again on the IA level). Using this formula produces a 35.54 rating for McCarney. Needing a name for the formula, I decided to name it after one of my favorite baseball players, Jamie Moyer. Why? Because coaches that rate highly in this index will have enjoyed a long career with average results. 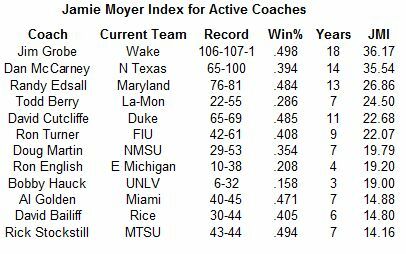 Here are the top-12 active coaches in terms of the Jamie Moyer index. In a photo-finish, Jim Grobe, the head coach of my alma mater edges McCarney for the Jamie Moyer crown. Since some of these gentlemen may have toiled in relative obscurity I'll give you dear reader, a brief bio of each. 1. Jim Grobe--Hard to believe, but this is Grobe's 13th season at Wake Forest. He has taken the Deacs to five bowl games, with the apex coming in 2006, when Wake Forest somehow ended up as ACC champions. Prior to coming to Winston-Salem, he spent six seasons at Ohio where he won eight games in 1997. 2. Dan McCarney--The man who inspired this little research project. I examined his career earlier in this post. 3. Randy Edsall--Edsall got his start leading the Huskies in their transition to IA football. In his final season at the school, the Huskies won the Big East (via tiebreaker) and headed to the Fiesta Bowl. Since leaving, he has not found a great deal of success at Maryland. 4. Todd Berry--Berry was a successful coach at the IAA level, leading Illinois State to back-to-back playoff appearances. However, like Pauly Shore, his time in the Army did not go well. Berry became the head coach at Louisiana-Monroe in 2010 and led the Warhawks to their first bowl game last season. 5. David Cutcliffe--Cutcliffe had good success at Ole Miss and has made Duke competitive. However, in his best campaign at Duke, he still lost seven games. 6. Ron Turner--Turner is most famous for coaching the Illini for eight seasons. While they were poor for the most part, they somehow inexplicably won the Big 10 in 2001. 7. Doug Martin--Martin (not that Doug Martin) coached Kent State for seven seasons and could never quite get them over the hump. In the offseason, he accepted an even more thankless job at New Mexico State. 8. Ron English--Speaking of thankless jobs. English manged a 6-6 mark in 2011, the Eagles first non-losing season since 1995. 9. Bobby Hauck--Hauck had great success at Montana, winning 80 games in seven seasons, making the playoffs each season, and coaching in three national championship games. However, Vegas has been a different story as Hauck has lost nearly twice as many games as he did at Montana in half the time. 10. Al Golden--Stepped into an incredibly tough situation at Temple in 2006 and then into a big-time scandal (and not the good kind featuring Patty Smyth) at Miami in 2011. 11. David Bailiff--Bailiff got his start as the head coach at IAA Texas State and led them to the playoffs in his second season. In his second season at Rice (2008), the team won ten games for the first time since 1949! 12. Rick Stockstill--Three bowl games in seven seasons is not a bad lead-in on a coaching resume. 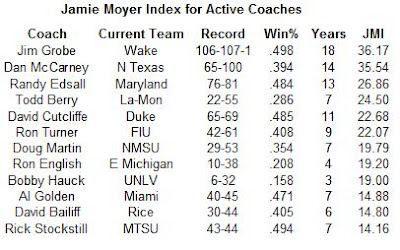 For the most part, the Jamie Moyer index does a fine job of identifying coaches with long careers and mediocre (in general, not based on the school they coach at) winning percentages. Nine of the twelve coaches have held head coaching jobs for at least seven seasons and if we round McCarney's winning percentage up just a hair, eight have winning percentages of between 40% and 50%. Of course, some coaches have been so awful in such a short period of time (English and Hauck) they also appear on the list. If I run the list of active coaches next season, those two gentlemen likely will not be found as they will almost certainly be given their walking papers sometime in the next four months. We've completed our BCS conference previews, so now we turn our attention to the mid-majors. We'll start out west with the preeminent mid-major league, the Mountain West, which will stage its first championship game this season. Unlike college hoops, college football teams don't really develop a reputation as postseason chokers. College basketball has a real postseason where every team has a shot to cut down the nets. Ask any Notre Dame, Pitt, or Wake Forest basketball fan about the stuggles of their teams in the NCAA tournament, but bring a handerchief. On the other hand, college football's postseason is really just a plethora of exhibitions and one playoff game. That being said, the current twelve teams that make up the Mountain West have not exactly set the college football world aflame in their recent postseason trips. Since 2005, current Mountain West teams are just 18-27 in bowl games. They are a shade more respectable 20-25 Against the Spread (ATS). 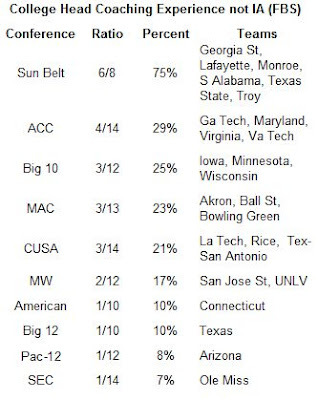 Boise State and San Jose State are the only team's with a winning bowl record, both straight up and ATS. The Broncos are 5-3 and the Spartans are 2-0 under both measures. 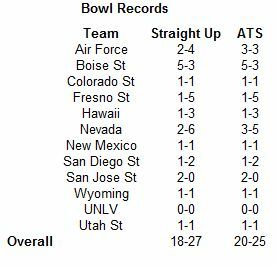 If we take away those two teams, the other ten are just 11-24 straight up and 13-22 ATS.The following table summarizes the bowl records of current Mountain West teams since 2005, both straight up and ATS. Perhaps more damning than the overall bowl record is the record of the bowl 'regulars'. Four teams besides Boise State have participated in at least four bowl games since 2005 (eight seasons). Those four teams, Air Force, Fresno State, Hawaii, and Nevada are just 6-18 straight up and 8-16 ATS. Keep this in mind when making your bowl picks in four months.